Over the course of several years and two great previous albums, Oddio and Reject, Edinburgh Hip-Hop collective Stanley Odd have been plying their own take on Hip-Hop, complete with Scottish accents, unforgettable hook lines and excellent live shows. 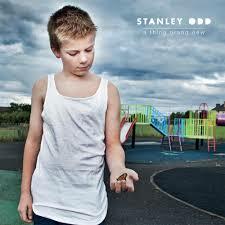 And on this, their third album, Stanley Odd have delivered their most accomplished album yet. The album closes with the earlier single ‘Son I Voted Yes’ which delivered their stance on the Scottish referendum. Whilst the result was a ‘no’ the strength of feeling among many north of the border is that this is an issue that won’t go away, and this is actually an upbeat tune about the referendum and hope. There will be those who attempt to draw parallels with them and Young Fathers, with the latter having just won the Mercury Music Prize. Both fine acts, but they share a city and not much else. Stanley Odd have always stuck to their guns – and if there is any justice this will be the album that breaks them through to a wider audience. A Thing Brand New was released by A Modern Way on November 10.